This concrete cast stone address block has deeply etched numbers and letters. 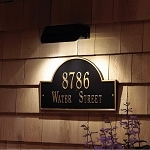 This light weight, high quality address plaque is extremely durable. An acid washing look is available. (Acid washing gives the address block a rough look, exposing the sand underneath the top surface. The degree of acid wash will vary.) Complete mounting instructions are included. 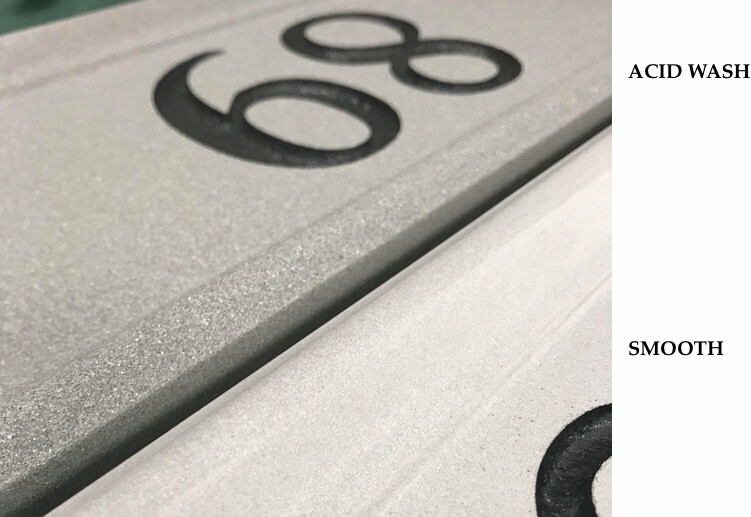 The single line address block holds up to five 3.5" numbers on a horizontal plaque; vertical letter size will vary. Please allow extra time for the toasted almond color. When the "holes" option is selected, the manufacturer drills 1/4" dia x 3/4" deep "blind" mount holes in the back of the block. Two threaded steel rods for mounting are provided. If "no holes" are selected, no studs are provided. Complete mounting instructions are included. For future reference, the information is under "Specification" in the product description.